Young plays in a game against the Lakers earlier this year. Right place, right time; Young has been the answer to the Hawks’ point guard prayers and by all accounts would be a shoo-in for this season’s Rookie of the Year award if not for the 20-year-old Slovenian wunderkind Luka Doncic of the Dallas Mavericks, a fellow rookie candidate. The two players have set the league on fire at times, lived up to all of the preseason hype at others, and for anyone’s money could be the co-Rookies of the Year. Here are three reasons why Young should have a share of the award with the player he was traded for last summer on draft night. Young and Doncic have made their teams better. With three games remaining—two on the road and one next Wednesday at home against Indiana—the Hawks have already won more games this season (29) than they did last season (24). The addition of Young, not to mention fellow newcomers—veterans Vince Carter and Alex Len and rookies Kevin Huerter and Omari Spellman—has the team looking more like a future playoff contender. But an argument could be made that Young is the direct reason why the Hawks are better this season. Like the Hawks, the Mavericks have also won more games than last season (as of Wednesday night the Mavericks are 31-47, a seven game improvement from last season), and Doncic is most certainly the reason why. Young not only has 29 double-doubles this season, but has seven 30-point, 10 assist games. Doncic has not recorded any of the later. Doncic is shooting .327 from three and is averaging 21.1 points, with 7.6 rebounds and six assists per game. He leads the Mavericks in all three statics including steals at 1.1 per game. These are all impressive statistics, but none leave Doncic among the league’s best. He’s a record-setter who keeps the crowd excited. On Sunday, Young was having arguably the worst game of his career. At the final three seconds of the game, Young had shot 4-18 from the field, 2-9 from three-point range for 10 points, and was, at least for the moment, out of the picture with the Hawks down 135-135 against the Bucks. 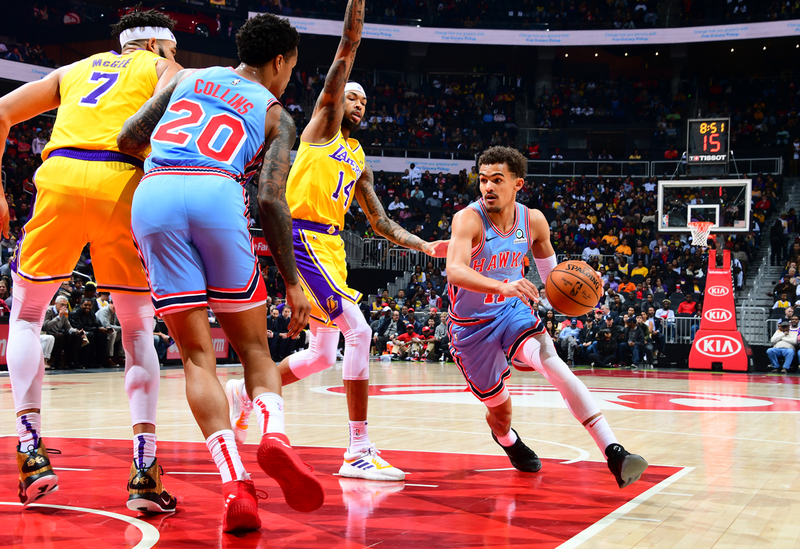 Young was on the court—he had played 35 minutes that night—but the play call from first-year Hawks head coach Lloyd Pierce was for a lob to star power forward John Collins. The inbounds pass from Huerter to Collins didn’t work out, but the rebound fell right into Young’s hands. He promptly tossed in his third game-winner of the season just as the buzzer sounded. The game-winner brought the near-capacity crowd to its feet, but it wasn’t something they hadn’t seen before. Last month Young won a game against Philadelphia with a floater as the buzzer sounded and the fans erupted. That night he pointed to his chest and said, “This is my house!”—or something to that effect. He was right. Young earned NBA Player of the Week for averaging 25.3 points and 11.3 assists per game while helping the Hawks go 2-1. Doncic has yet to be awarded that same honor, with two weeks to go in the regular season. During his postgame press conference on Sunday, Coach Pierce was asked if Young deserved to be Rookie of the Year. Pierce added, “I don’t know how many rookie records he has here with the organization.” For the record, Young has quite a few. He scored a career-high 49 points in a 168-161 home loss to the Chicago Bulls on March 1, a hawks rookie record. His career-high 17 assists against the Los Angeles Clippers on November 19 is also a Hawks rookie record. His 624 assists are also a franchise rookie record, as are his 152 (and counting) made three-pointers. Doncic has had his moments this season, including a career-high 35 points, which he scored twice in a January 27 loss to Toronto and in a February 2 win over the Cleveland Cavaliers. And at 19, he was the second-youngest player in NBA history to have recorded a triple-double when he had 12 points, 11 rebounds, and 10 assists in January. Impressive numbers on any level. Yes, the Atlanta Hawks will miss the playoffs for a consecutive season, but the culture has changed and the expectations inside State Farm Arena have changed, with the energy now feeling back to the way it was a few seasons ago when the Hawks were an annual visitor to the postseason. A lot of that transition is because Young is in the building. During the third quarter with Young at the free-throw line preparing to score his 18th point of the game fans started chanting “Rookie of the Year.” That’s not something you hear in this arena too often. Pistol Pete Maravich didn’t do it, neither did Dominique Wilkins, Al Horford or John Collins, respectively. 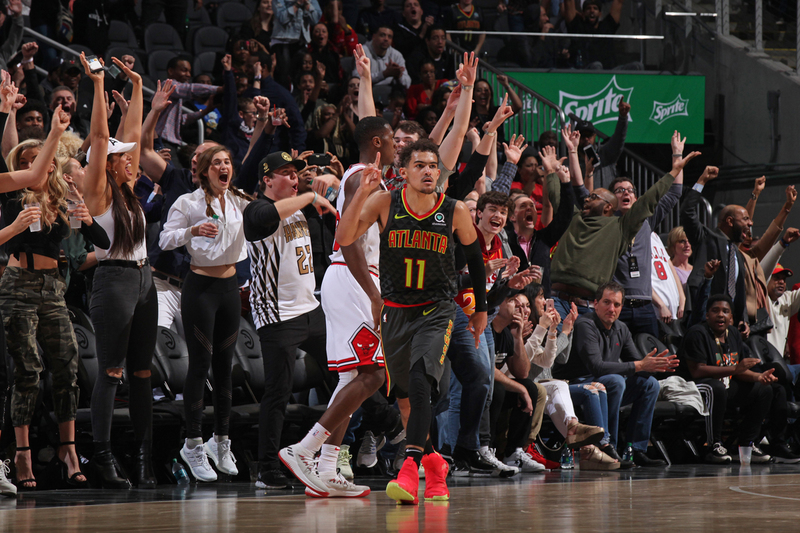 Trae Young has a chance to continue breaking the mold here in Atlanta and should be the first Atlanta Hawks player to be named NBA Rookie of the Year.